Carnot Batteries are an emerging technology for the inexpensive and site-independent storage of electric energy at the gigawatt hour scale. 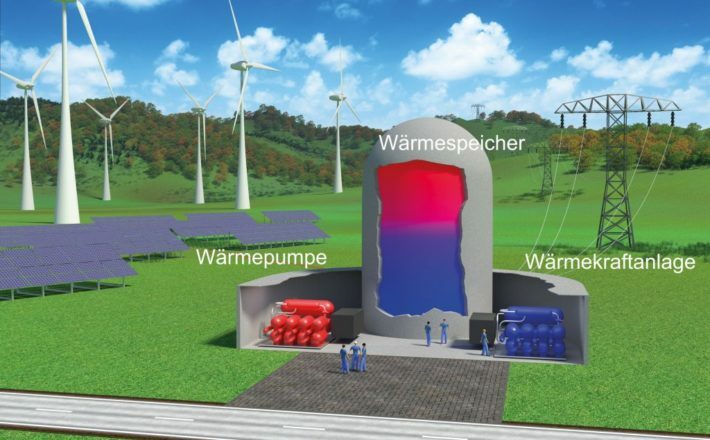 Also referred to as “Pumped Thermal Electricity Storage” (PTES) or “Pumped Heat Electricity Storage” (PHES), a Carnot Battery transforms electricity into heat, storage the heat in inexpensive storage media like water or molten salt and transforms the heat back to electricity when required. Carnot Batteries have the potential to solve the global storage problem of renewable electricity in a more economic and environmentally friendly way than conventional batteries. Although several concepts have been proposed for Carnot Batteries, there exist neither a comprehensive techno-economic assessment of this technology nor laboratory or plant scale demonstration facilities that provide the energy storage community with scientific data. The first goal of the workshop is to bring together experts in energy storage, in particular thermal energy storage, in order to assess the state-of-the art of research and demonstration of Carnot Batteries. The second goal of the workshop is to establish an International platform that coordinates research in Carnot Batteries and makes it internationally visible. The workshop will be opened by a keynote lecture by Nobel laureate Professor Robert B. Laughlin (Stanford University) – author of the book “Powering the Future” – who initiated Google-X’s Malta project. Invited lectures by Dr. Toru Okazaki (IAE Tokyo) and Professor Yulong Ding (University of Birmingham) will review the development of Carnot Batteries in Japan and UK, respectively.